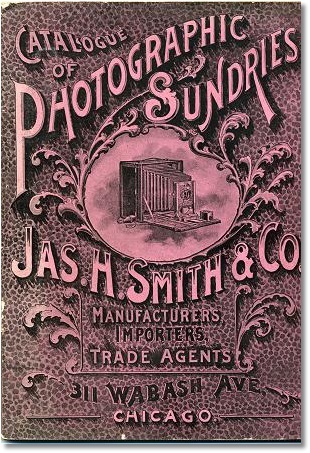 The 1870s represent an interesting transition period in American camera manufacturing. Dominant wet plate photography started ceding to dry plate technology. At the same time, the classic tailboard field body pattern (fixed front with focusing rear) was being refined into the popular design synonymous with the 1880s and 1890s. Major American makers such as Anthony, American Optical, and Scovill were familiar names, yet enterprising builders also tried their hand at camera manufacturing during this decade of change. Enter Nathan Stockwell and George W. Parker; two entrepreneurs who opened a photograph gallery sometime in early 1872 in the small town of Bainbridge, NY. The gallery itself was short lived and according to a Bainbridge historian, the gallery was advertised in the 1872 issues of the Bainbridge Republican but not listed in the May 1871 or 1874 issues. What makes this story interesting is that on June 17, 1874, Parker filed for a patent (No. 159,443 granted on Feb. 2, 1875) for an "Improvement in Camera Attachments." Parker's patent describes a solid bed camera body and a novel plate transfer system. According to the 1875 patent it was "for taking photographs out of doors; and it consists in the construction and arrangement of the camera proper, a plate-box containing the prepared plates, and an intermediate device used for transferring the plates from one to the other, and vice versa, the object being to prevent their exposure to the light while thus transferring them ..."
Stockwell's tiny ¼-plate camera is marked "N. Stockwell, Bainbridge, N.Y." with serial number '22.' While it does not look like the camera in Parker's patent, it was purposely built to use the Parker plate-transfer system. 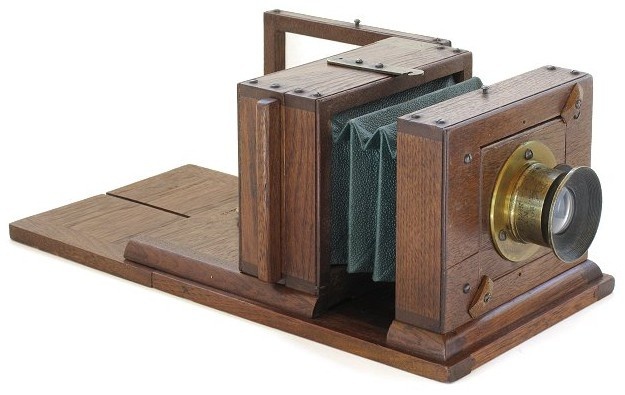 The camera is constructed of walnut, has a beautiful blue-green leather bellows, uses a lap-joint construction technique similar to cameras made by Simon Wing, and has a distinctive modular design. Screws along upper body surface ensure long lasting joints. The Stockwell camera also includes a plate box and dry plate holder exactly matching the patent. Moreover, the plate box has the patent date and '22' stamped on it, indicating it was made for the camera. Refer to the Stockwell Camera Patent page for more insights about the camera and patent. Unlike apparatus by the leading builders, Stockwell's modular camera securely stores all major components (dry plate box, dry plate holder, and hinged ground glass) on the extended bed. A brass arm mounted on top of the camera rotates to hold screw-heads that anchor everything in place. 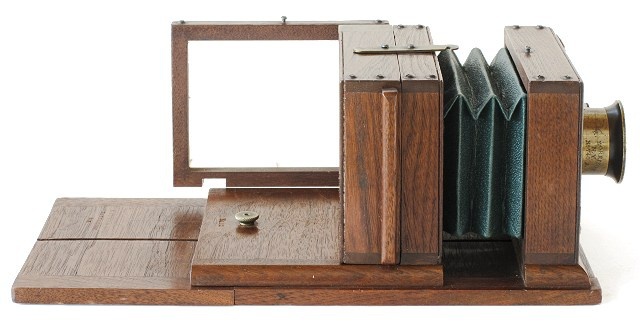 Interestingly and in character with the 1870s, the Stockwell camera also includes a wet plate holder (not shown) made of the same wood but with a slightly different construction; which implies it might have been made separately from the camera. At this time, the ¼-plate Stockwell camera presented on this page is the only known example. It is a professionally constructed camera of high quality but no advertising has been found. Serial number '22' on the body and plate box would indicate other cameras were made, but where are they? Maybe more will surface over time. 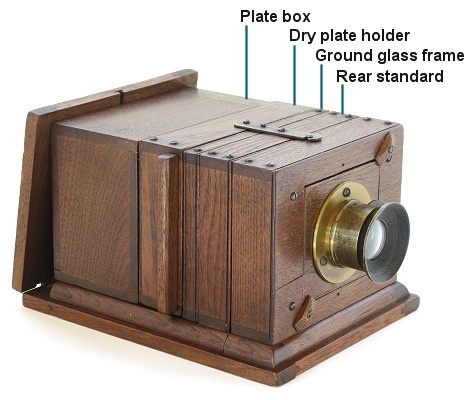 The only known example of a camera made by Nathan Stockwell (c.1875). 1/4-plate modular system camera with George W. Parker's plate changing system. Stockwell camera shown with modular components stored on its folding (solid) bed.